I’ve already written a little about the weight implications of choosing a dynamo hub (in short: there needn’t really be a significant weight penalty). However, there is still another objection to dynamo use – the friction which must constantly be overcome as you ride along. I hope to demonstrate that dynamo hub drag is not much of an issue for the majority of riders, and more of you should be giving serious thought to investing in one (especially as you can now enjoy a discount from our favourite mail order stores). Let’s start by putting some hard numbers on friction losses in ordinary hubs, before moving onto dynamo hub losses. Manufacturers of ceramic bearings have helpfully quantified this (because you can’t sell a fancy bearing without demonstrating how ‘bad’ ordinary ones are) and it seems that losses in an ordinary hub are around 1W at 25mph . So at a more reasonable 12.5mph, a ‘typical’ front hub will lose roughly 0.5W. With the lights switched off, dynamo hub friction means a loss of 1-2W at the same speed, for a penalty of 0.5-1.5W over the ordinary hub. With the lights on, 7W is a good estimate. “Mini” dynamos like the SON 20R / SONDelux or Shutter Precision SV8 save around 1W on “full fat” ones like Shimano’s Deore, 3n72, or 3n80 series  . The ratio of darkness:sunlight during the summer months most favoured by long audax rides is not far off 1:5 (civil twilight in mid-June gives 19.5h of light and 4.5h of ‘dark’). This gives an overall hub dynamo drag of under 2.5W (averaged across all the hours of a day), so let’s use that as the basis of comparison. What’s the impact of 2.5W? 1% of an hour is 36 seconds, so double that means you will fall back 1 minute 12 seconds per hour compared with your battery powered self: twelve minutes over a ten hour event. A robust 200W effort reduces the impact to 0.75% (27 seconds per hour) or 4.5 minutes over a ten hour event – should you be one of the few who can put in that kind of effort for a whole event! Another way this is popularly expressed is in terms of synthetic gradient, with the hub dynamo friction made equivalent to an extra X feet per mile of ascent. It turns out this is not such a difficult calculation, and comes to around 28cm per mile for a dynamo during daylight and 2m per mile for a dynamo at night. Scroll to the end if you want to see the maths! So far you are perhaps thinking “OK, so 5-10 minutes over a ten hour event isn’t such a big deal, but it’s still something I’d rather avoid”. Fair enough. 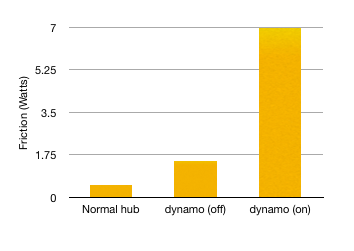 This makes it a good point to contrast hub dynamo drag with some of the other things that can hold you back. For instance, it was recently reported that some types of chain lube can add as much as 10W over the factory lube  while, at only 12.5mph, the difference between a Continental GP3000 racing tyre and Vittoria Open Corsa racing tyre is already 20W . When the difference between ‘good’ and ‘bad’ chain lube and two superficially similar tyres is around 30x more than the difference between an ordinary hub and a dynamo (daylight hours) and 4x more than the difference between an ordinary hub and a dynamo (at night), you’d better start asking hard questions about your chain cleaning products/routine and whether or not you should be splashing out on new tyres! 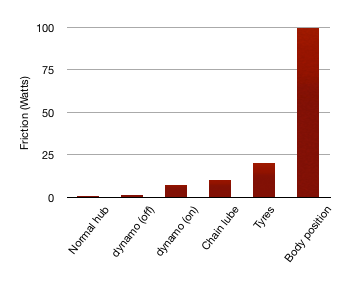 Even sample variation between production runs of any particular tyre probably exceeds the drag of a hub dynamo with the lights on… but how many of us spend as much effort making sure to buy just the right examples of a particular model of tyre as we do avoiding dynamos? As I mentioned up-page, even Wiggle are in on the action: get yours here. Disagree with the maths or had an experience (either way!) that you’d like to share? Please drop me a comment below! If you have to stop to change batteries on the 10 hour ride at 12.5mph you should get back a chunk of the 12 minute time loss due to the dynohub. On PBP I was using an AA battery holder to power my lights. I stopped at Loudeac on the return to buy more batteries, but the hungry randonneurs had tried to purchase every AA battery on route! So convenient and reliable to use a SON 20R hub and LED lights on my 49 day / 15,000km around Oz Record ride in 2010. Not always a place to recharge and up to 18 hours of riding a day would be pushing it for battery light sets. Thanks Pete – good to see you on here! I think your calculations of the time penalty are a bit pessimistic. Largely due to wind resistance, speed doesn’t increase linearly with power applied. It does (almost) at first, but as speed increases you need more watts for each successive mph. Consequently, losing 2,5% of the input power at speed will affect your speed by a considerably smaller percentage, maybe just 1% or less. There’s a decent online power calculator at gribble.org It shows that at 100W, the 2.5W drag (2.5% power loss) equates to 1.01% speed loss (0.16mph). 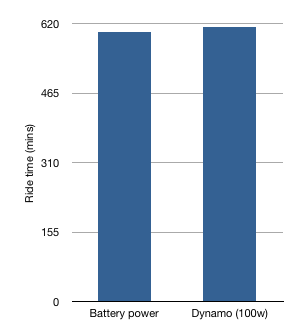 At 150W, the 2.5% drag (now 1.7% power loss) equates to only 0.6% speed loss (0.12mph). I can’t vouch for the accuracy of these figures, but the trend does illustrate the point. 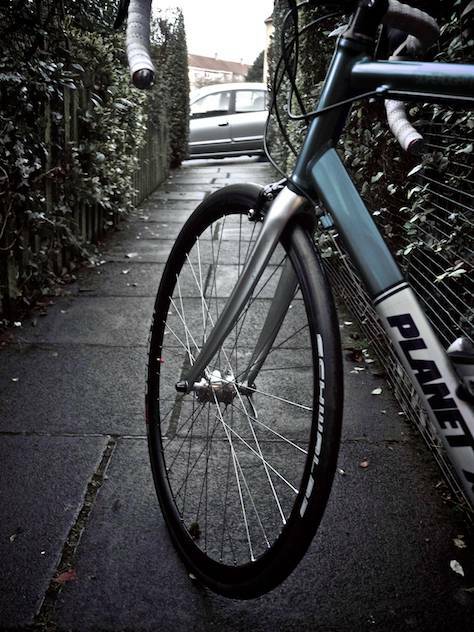 BTW, I’m in the process of equipping my bike with dynamo lights, so keen to justify the purchase to myself! Thanks for the comment. Yes, I was deliberately giving the worst possible case (rather than introduce aerodynamics too), so you’re correct that the real world impact is even lower. I basically agree with your article but I think that the aerodynamics issue may be further developped: Apart from the recumbent/upright question, I guess that other bicycle components (wheels, brake system, fork, frame tubes) as well as the cyclist himself (his body shape and the type of clothes he wears) play a significant role in bicycle aerodynamics. And another point about recumbents: They are heavier bikes and have some additional chain pulley(s) and/or chain sleeves which certainly increase friction losses. Some of the models have since been superseded, but the Shimano you linked to seems like a successor to the well-rated DH-3N70/71. I’m curious about the big picture of switching over to a dynamo, though: could I build the 72 into my current front wheel (without any wheelbuilding experience), or would you recommend having it done by a shop? Taylor Wheels has a range of complete dynamo front wheels on eBay, but they currently seem to use only the cheaper Shimano hubs, with bearings the BQ comparison suggest are less durable. Prices are reasonable, though. Also, are there other parts besides the lights themselves involved (I know there’s a converter required for charging gadgets, but not too motivated in that direction)? Do you have a rough estimate of cost for going straight from conventional wheels to a dynamo setup? It isn’t too difficult to build a wheel (especially a front wheel) but the best thing would be to buy a rim and suitable length spokes. You’d almost certainly need new spokes anyway, as the hubs will be different sizes, and it will be quite a lot quicker and easier if you don’t have to dismantle your existing wheel before you start. That said, it won’t cost much to get a decent local shop or one of the online builders to make you a wheel, so it depends whether you value the learning experience or see it as an extra cost (your time cost to get the build out of the way). You only need the wheel plus light (the front light will have a built-in cable that is long enough to plug into the hub, and the hub will come with the relevant plug to fit to the end of the cable). If I was doing this right now, the 3N72B at 33% off is looking like a solid deal, paired with a rim of your choice (I really like the H Plus SON Archetype – here). You pay your money and take your choice when it comes to spokes… I generally go for whatever double-butted spoke happens to be on the best discount. The 3n30 hubs aren’t too shabby. Just cleared 8000 miles on mine since 2010, still going nicely. You never forget your hub dynamo, and building your own standlights really isn’t hard. I don’t even have a switch to turn mine off.